The mission of Yemi Morafa’s coming-of-age movie Funke is simple: shatter the glass ceiling on gender expectations for women. Set in 1996 Ibadan, the film tells the story of the titular character navigating her way in a patriarchal world enforced by custodians of culture and tradition. Her dreams to become a footballer is, in itself, an oddly refreshing script. In the teaser, her mother harshly tells her that women belong in the kitchen and there are other jabs like her getting entangled in teen pregnancy. That said, she isn’t deterred. There’s a scene in which she attends a football match and slips into the persona of a coach, yelling out instructions. For a long time now, football has been regarded as a profitable career wherein parents egg on their children to pursue, if they show interest. But it’s predominantly a landscape occupied by men. And there’s the tendency to trivialise women in the game of football. Even in the current national football terrain, men are rated higher, paid better. Morafa’s Funke is distinguishingly interesting for it’s gender-defying attempt at sports. 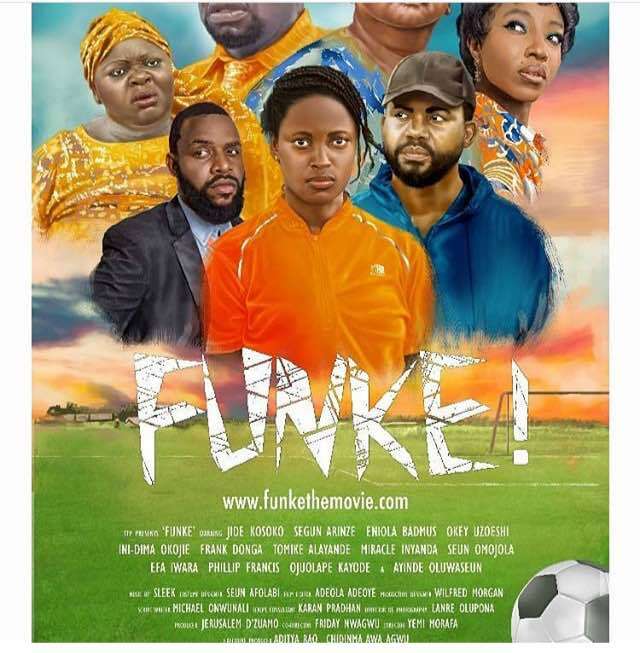 Starring Jide Kosoko, Segun Arinze, Okey Uzoeshi, Tomilake Alayande, Frank Donga, Ini-Dima Okojie, Efa Iwara, and Eniola Badmus, Funke will hit select cinemas on September 7. Here’s the trailer below.